It is so easy to complain about service, so when an employee goes above and beyond good service into stunning actions, he deserves praise! Never so grateful to have someone chase my car before. Having a rough day with a lot on my mind. I needed a good cup of coffee. Placed my order and the clerk thought the clerk had a great personality. There was an elderly lady ahead of me, who just wanted to talk. She didn't notice I was there, and when she did, she apologized. I told her it was ok and I was in no hurry. The clerk treated her with patience and respect. I placed my order and left. I forgot one of the drinks but didn't notice. Next thing I knew, Guillermo was standing next to my car with the drink in his hand. 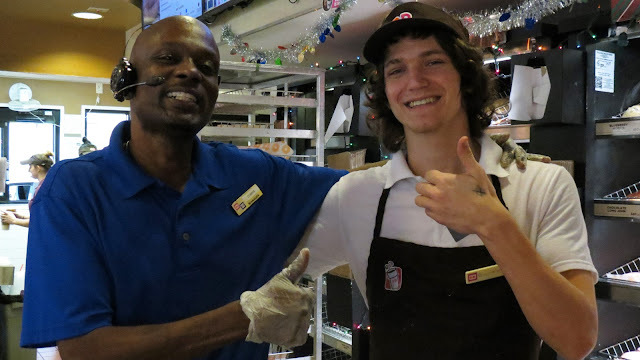 This is Guillermo Gerristen, an employee of Dunkin Donuts on Red Bug Road, Oviedo FL. He's the one who chased my car, not just into the parking lot, but on the next road while I was waiting for the light. I had to go back to thank him properly, naturally with my camera since it was something that we just don't get to experience often enough!